Learning to create a Warm Up Phrase for pupils at KS1. An example of how apparatus can be used to make Gymnastics skills more accessible for the least physically able. Exploring ways of showing copying shapes involving apparatus in contrasting ways. Exploring basic contact in pairs as a starting point to progress towards weight taking balances. Compositionally developing a Warm Up Phrase to show complementing. Exploring copying, complementing and contrasting shapes in groups. Exploring ways of adapting floor work to involve wall bars. Sharing sequences with observers looking for and providing feedback on effective use of compositional devices. Achieving counter balance - both gymnasts establish a position they couldn't hold independently! Creating a group Gymnastics tableau showing basic contact. Exploring ways of adapting Acrobatics Gymnastics balances to involve apparatus. Double challenge - adapt a group floor work tableau to involve apparatus that also shows basic contact between all group members! Designing group balances showing different types of contact. Learning elbow balance as a progression towards headstand. A delegate cited the idea of using beanbags in Gymnastics as their PE conference 'light bulb' moment which then inspired development of a whole conference workshop based on this concept. My contribution to International Handstand Day 2015. Delegates learning effective supporting techniques on the British Gymnastics Award Scheme Coaching for Schools course. Exploring more complex skills as a means to challenge more physically able pupils. 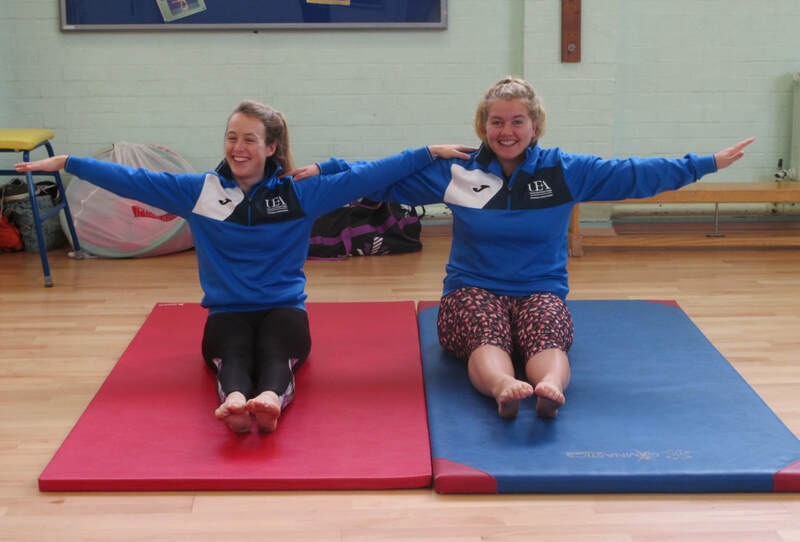 Exploring ways of extending and integrating the British Gymnastics Core Proficiency Award Scheme hand apparatus skills into extra-curricular Gymnastics sessions. Using a mix and match tool to explore involving hand apparatus in the performance of Gymnastics actions. Using the British Gymnastics Core Proficiency pack wall charts as a support resource for teachers and pupils to select/develop skills related to different unit of work themes. Trainee PE teachers outlining a unit of work at the end of the British Gymnastics Secondary Teacher's Award course. Exploring ways of developing body tension as a progression towards handstands. Learning to perform the 7 phases of vaulting showing technical accuracy before a vault is even introduced.